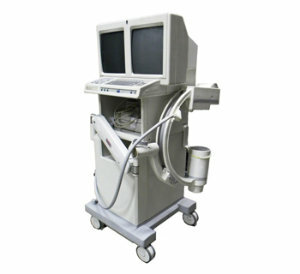 To introduce a mini c-arm into your practice, the GE OEC 6600 may be the perfect imaging device to start you off. Available at a lower cost than its bigger counterparts and its costlier stablemates, the GE OEC 6600 comes with standard CRT monitors and a resolution of 512 x 512. With a 27” x 27” footprint, it can easily be transported for use even in space-constrained areas. Should you need more capabilities for your expanding practice, the OEC 6600 can be upgraded with a clinical and hospital platform. These add more image processing capability. Even though GE has announced that it will no longer produce mini c-arms, parts for this unit are easily available. It has many of the same parts as the more advanced GE OEC 9600. Small, flexible, and cost-effective, the GE OEC 6600 may be the unit to fit your space, your budget, and your requirements. Contact Providian now and inquire about a refurbished GE OEC 6600 mini c-arm! I want a free price quote on the GE OEC 6600, send it today!